RTG DKK: 0/0 - FCI "A"
Ysel is my destiny. As a puppy, I helped her choose a friend and breeder kennel "od Dlouhe stezky " Miloš Vlašek in the Hungarian Kennel Comme un Reve Noir. Miloš completed all their exhibitions, medical tests (except BAER test), tests and bred, and the first litter of puppies. Unfortunately, Miloš stoped the breeding of Groenendaels, so I had in 2006 asked Ysel rented home on a litter of puppies (L-Deabei). After our litter she returned back to Milos. 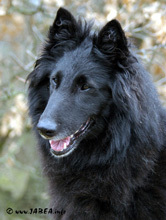 A year later, at the same time, she died 15 years female German shepherd of our aunt, offered me Miloš Ysel for sale. So we bought Ysel for our aunt. She lived in a house with large garden and great sofa for Ysel: o) She stayed by us only when she had puppies "O", "Q" and "U". In October 2009, unfortunately, our aunt serious health reasons had to sell the house and went into care home, where dogs not allowed. Ysel stayed with us. Sadly no puppies at all was not lost into the pack (if she had puppies all the respect her) and all of our females did not like her even when they normally based, if it has an excuse (fetch, chow, lair, or watch the fence), Ysinka was as a foreign member of the pack took the wrong ... So we must to find her new home again :o( - for her peace, and for peace of our pack. Ysel from 11/2009 lives with her daughter Upla Deabei by the family Václavík in Olomouc and I hope that he will remain there forever and will do just happy as it can. Ysel is a good unconflictful dog with extreme drive. It features an amazing temperament and acceleration. She is absolutly friendly to people, well guarded. Ysel has not reaction to shooting, but with advanced age she began to interfere with fireworks and a storms - a reaction such, but it was natural, nothing horrible. Ysel has great tendency to weight gain, so I would never have been on any show, because our aunt did not give weight. 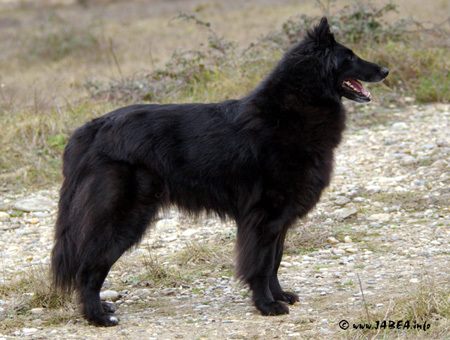 Otherwise she is a very beautiful female, with a beautiful face and deep black eyes, perfect ears, excellent physique, noble head and extreme coat. She is a mother of our Lapu Deabei who died tragically. The breeding of us will continue her daughter Odetta Deabei and Ulamka Deabei, which are owned by the family Juřica.